At least it has given me time to think about some little projects that need doing, in addition to my orders and tack projects for myself. Recently I bought a wooden pastel box with the intention of converting it into one of those swanky tack cases. First thing's first, I don't use pre-cut leather lace. I use the same leather I make my saddles out of, but seek out the thinner areas with no blemishes. By doing it this way I get exactly the right thickness for straps and can also do more creative ideas. Below is a shot of all the parts required for a saddleseat bridle and there are also some stirrup leathers - can you recognise all the parts? Once all the parts have been cut and hole-punched, I dye the parts using standard techniques. I place different projects on different pieces of scrap paper so nothing gets mixed up. Once dyed and dried the pieces will go into baggies according to their project. The photo below shows an un-dyed double bridle, a dyed double bridle (on the right), and some scrap pieces that I will use for all the extra fiddly bits (top left). I have to make sure these bridle pieces don't get mixed as although they are both double bridles for saddleseat, one is slightly finer than the other one. I know many people may prefer pre-dyed lace as their is less chance of the dye transferring to a model, but as long as the tack isn't left on a model too long this shouldn't happen. It's only happened to me when I've been lazy and left tack on between shows a week apart. 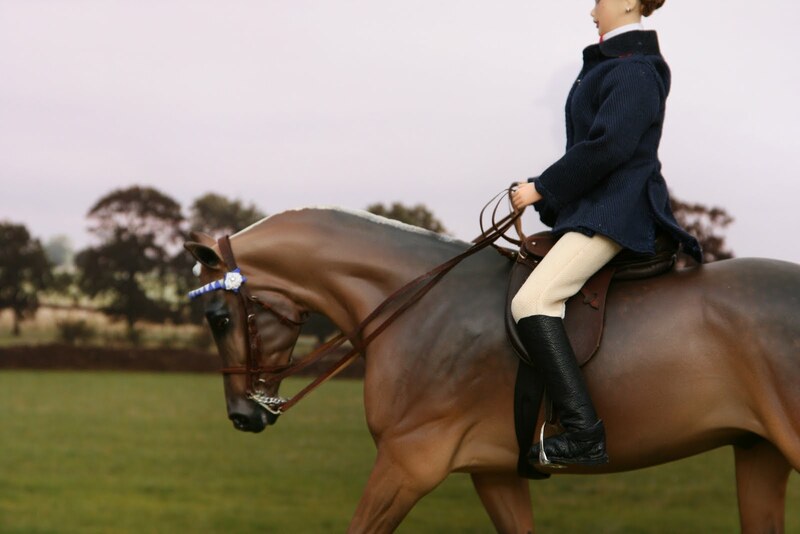 I would never recommend leaving models tacked up anyway, pre-dyed leather or not, as buckles and stirrups can scratch and reactions can happen to the models finish. Hopefully the next post will show these bridles finished and with their saddles that I made back before Christmas! This has taken longer than I intended (as with all things I make!) but is finally finished! I think I should realise by now that everything always takes twice as long. The breastcollar is a bit loose in these pictures - I need to just add one or two more holes and then it's perfect. I'm pretty pleased with how it's turned out considering how long it's been since I made a western set. These shots show my latest 'tag' that I will be using with all new sets. Here are a couple of shots of two of my models. Above shows Merlin, who is an Equorum model handmade in Dorset in the UK by Helen Moore. They are made of latex with silk manes and tails and come in a wide variety of moulds and colours (in fact, any colour you want!). They are poseable too so brilliant for performance set ups. Merlin has been tacked up with one of my driving harnesses, which was actually made for a Breyer classic scale warmblood, but fits lots of others too. The dog-cart was made by Bill Duncan in the US and the doll was dressed by Kris Gallagher. The doll/cart/harness combo took a different model to overall Supreme Champion at a show back in August. Next up is Something Wicked, a Cooper resin I recently bought off my friend Teresa Botkins, who painted him a lovely silver bay. I had a little photoshoot with him in a variety of set-ups, including the Ridden Part-bred Arab set-up shown above. I can already tell he's going to be a very versatile model for performance. Again all tack was by me and unusually, I dressed the rider too (although that mostly consisted of some new boots and adjustments to the Breyer jacket). The backdrops in both shots were taken by me in the North Pennines of the UK. You can actually buy these backdrops from Kathy Casey who sells them. Anyway, the actual purpose of this post is to advertise one custom tack slot which would hopefully be completed in Feb/March. There was two advertised on my yahoo group but one quickly went so please contact me via my website at www.fourcornerstack.com with your idea. I will then get back to you with a quote and we can go from there. I'm happy to do most things except anything medieval or Peruvian, my patience just can't take the strain at the moment!